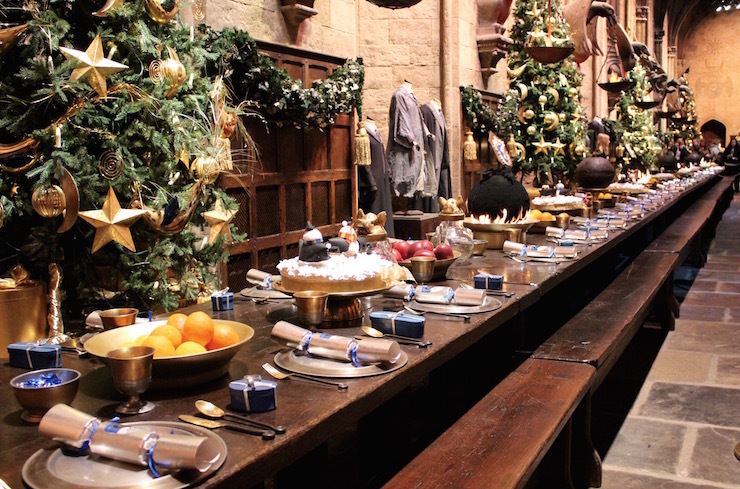 On New Year’s Eve we head to Leavesden, near London, to visit the studios where the eight Harry Potter films were made. Over a period of ten years, J. K Rowling’s marvellous series about the wizarding world was brought to life in a former WWII aircraft factory, and now the studios are open to the public. I’m with my husband, our daughter (17) and our son (13), and this is our second time on the tour. We first visited in 2012, soon after the tour opened, and we’re keen to see how it’s changed. 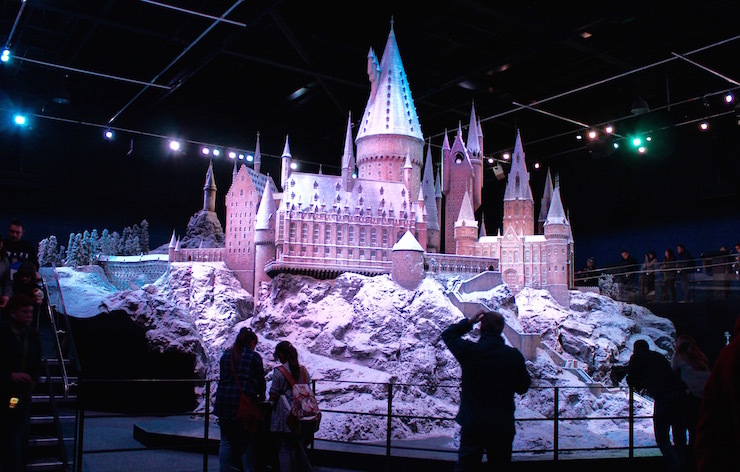 We’re also excited to see Hogwarts in the Snow: the studios have had a temporary festive makeover. We have to queue for about half an hour to get into the tour. Queueing is quite entertaining though, as the line snakes past the ‘cupboard under the stairs’ film set, and we’re surrounded by props from the films and by huge photos of the principal actors, as well as by a scattering of very excited small children. A bouncy boy behind us is wearing a long, black cloak and has drawn a very wonky pair of glasses on his face. The tour starts with an introductory talk and a short film about how the first Harry Potter book came to be filmed. The next room is a cinema, with extremely comfortable seats, where we watch a short film about the making of the film series. (On our previous visit I was too excited to concentrate on these films, but they’re actually very interesting). After the film, the screen lifts to reveal the entrance to the Great Hall at Hogwarts. The Great Hall is vast and impressive. The set was built with a real stone floor, to withstand the traffic from the hundreds of actors who appeared in the films. There are two huge long tables along the sides of the room, laid as if for Christmas dinner, with the teachers’ table at the far end. There are mannequins wearing costumes from the films displayed at the sides of the room, including the one worn by Daniel Radcliffe, aka Harry Potter, when he was 11 years old. A guide shows us the Great Hall, but from then on the tour is self-guided. There are also audio guides available. The tour allows you to explore two vast sound stages and the backlot which separates them. There are lots of information points where you can read about the displays. I love the Harry Potter books and films, and am fascinated by the film sets. 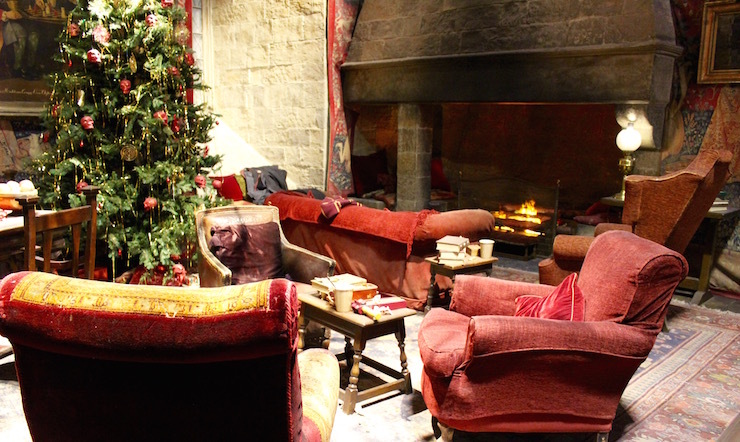 My favourites are the cosy Gryffindor common room, the Weasleys’ kitchen and the Gryffindor boys’ dormitory. There’s also Hagrid’s hut, the potions classroom, Professor Dumbledore’s office and many more. The craftsmanship and attention to detail evident in the sets, props and costumes throughout the tour is astonishing, and if you’re a Harry Potter fan it’s a joy to see how his magical world was brought to life. In the first sound stage you can have your photo taken riding a flying broomstick and driving Mr Weasley’s flying car, against a green screen. We did this last time we visited, so we don’t do it again. There’s also an area where you can learn some wand skills, and there are some interactive magical props in the Weasleys kitchen set. The next part of the tour is new since our last visit, and it’s thrilling to see: you walk through a passageway to be met by a marvellous view of the Hogwarts Express steam train. 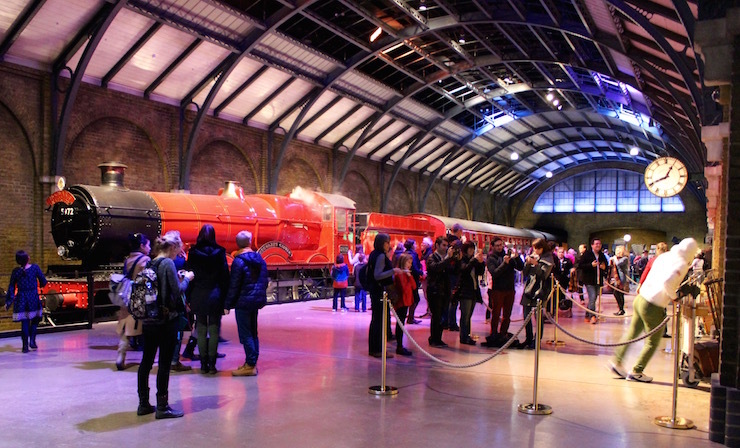 A 20,0002 foot expansion features a recreation of Kings Cross station’s magical Platform 9 3/4, and the original steam engine which was used in the films. There are a couple of luggage trolleys stuck in the wall where you can take photos, and you can walk through the old-fashioned train carriage which was used for the films. Each compartment of the carriage is dressed with props from a different film, and at the end of the carriage is the Honeydukes sweet trolley. There’s also a separate interior carriage set where you can sit for an official photo, or take your own photos against ‘windows’ featuring dementors and escaping chocolate frogs. There’s a gift shop on the platform. Our next stop is the Backlot Café, which serves hot meals and snacks. We eat the sandwiches which we’d bought at the Studio Café before the tour (the Backlot Café didn’t exist on our last visit, so we came prepared), and my son and I each have a ‘butterbeer’, but I don’t really like it as I find it too sweet. My daughter has a butterbeer ice-cream, and that’s very good. I’m pleased to see that you can also take in your own food and drink to the tour to eat at this point. Outside the café is the backlot with the exterior set for Number 4, Privet Drive, where Harry lived with his awful relatives, and where you can knock on the door. 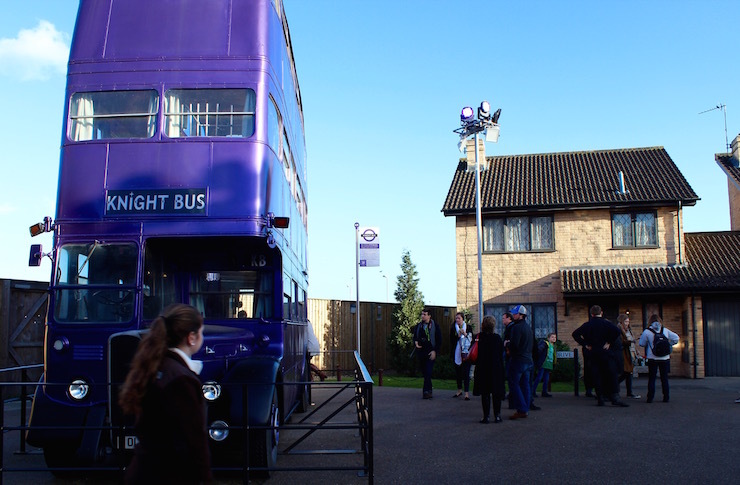 You can also see the marvellous Knight Bus, which you can step inside, Mr Weasley’s flying car and Hagrid’s motorbike (you can sit in the driver’s seat of these last two). You can also walk across a section of the intricate wooden Hogwarts bridge which first appeared in the Prisoner of Azkaban film, although it isn’t mentioned in any of the books. The second sound stage starts with a fascinating section which is devoted to Creature Effects. A member of staff shows us some of the prosthetic hands and feet which were used by the characters during filming. 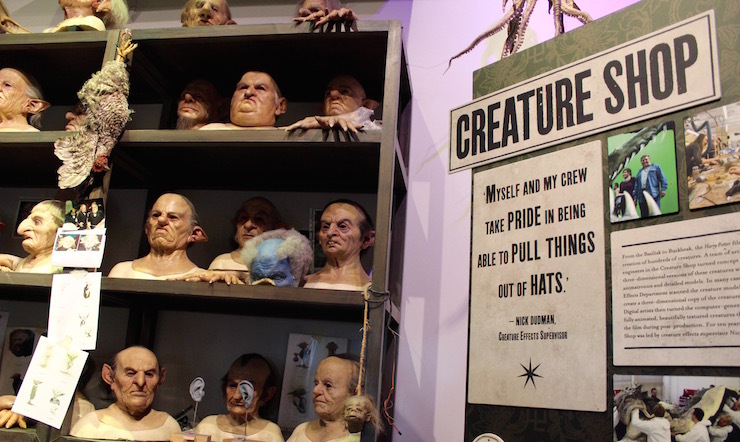 A team of artists, sculptors and engineers worked on makeup effects, animatronics and models here in order to bring J.K Rowling’s creations to life. They created more than 200 mythical creatures, including goblins, house elves, dragons and Aragog the spider, an animatronic which has an 18-foot leg-span and is so complex that it took 15 technicians to operate. 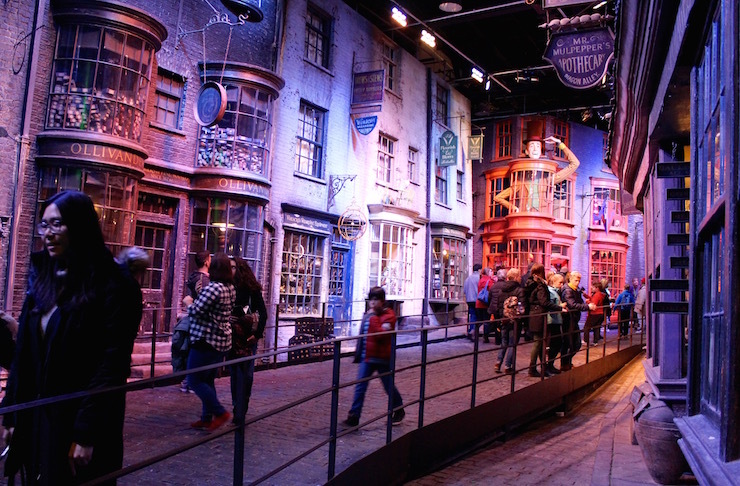 We make our way along the cobbles of Diagon Alley, marvelling at the shop fronts and peering in through the windows of shops such as Fred and George’s Weasleys’ Wizard Wheezes and Magical Menagerie, where Hogwarts students buy their magical creatures. The Art and Graphics section of the tour includes some of the amazing plans and artwork which were used to create the films. There are some intricate scale models of sets and props which are made of white card – they all look extremely dusty, but I guess that they must be tricky to clean. 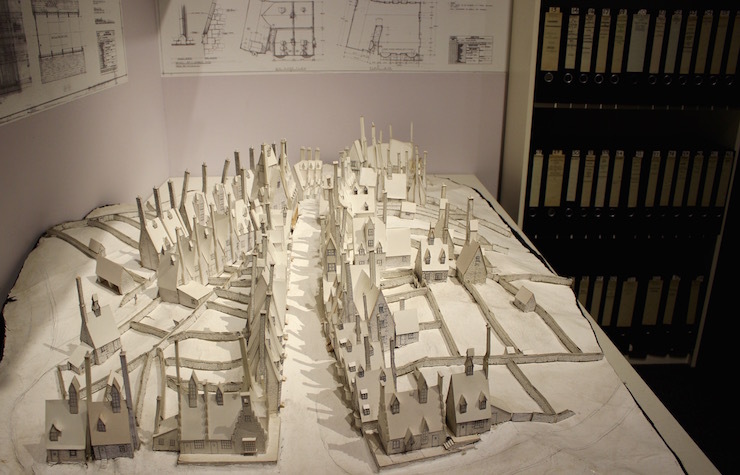 The 1:24 scale model of Hogwarts Castle is extraordinarily detailed and hugely impressive. The model was used to film exterior shots and it measures 50 feet across. Apparently, when all of the time spent on it by the artists and crew members is added up, the model took 74 years to build. You can walk all around the outside of the castle and view it from different levels and angles, and you can access a wealth of information about the model via the interactive screens which overlook it. Five hours after starting the tour, we exit through the gift shop, which is stocked with a vast array of Hogwarts-related items. My son chooses to spend £8.95 of his Christmas money on a box of jelly beans, which includes flavours such as earwax and bogey. I loved the tour and I’d definitely recommend it. I liked seeing the interior sets at the start of the tour best. If you can, I think that it’s probably good to book a slot at the beginning of the day to avoid queueing to start the tour – the earliest time slots are at 9am or at 10am. 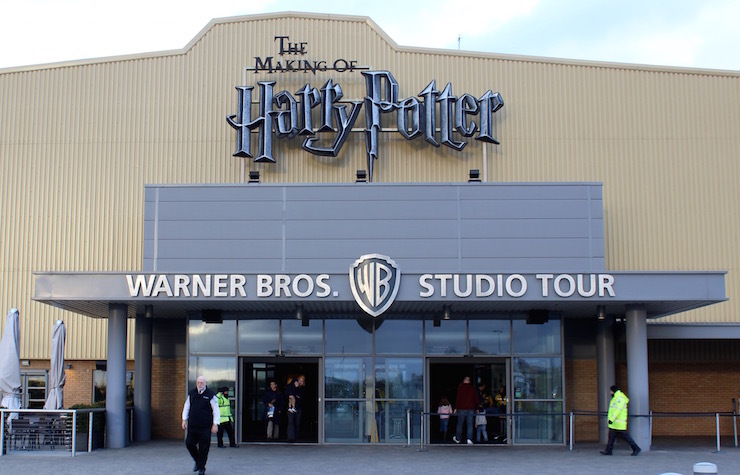 Tickets for the the Warner Bros Studio Tour cost from £33 for adults and from £25.50 for children (5-15 years old). There’s no charge for tickets for under-fives. Children are also given a free ‘activity passport’ to collect stampers during the tour. It’s simple to get to the Warner Bros Studios. If you’re driving, it’s close to the M25 and M1 motorways and there’s ample free parking. From London it’s a 20-minute train journey from Euston to Watford Junction and then a 15-minute ride on a shuttle bus. For more ideas for family days out in and around London check out my monthly London roundups. If you’re looking for a guide book, I recommend both the Lonely Planet London Travel Guide and the London Marco Polo Travel Guide. If you need London accommodation, check out my post about family-friendly places to stay in the capital, and my detailed reviews of the Amba Hotel Marble Arch here, the Hilton London Metropole here, Go Native Apartments here and the Royal Garden Hotel here. Disclosure: We were given tickets to the Warner Bros Studio Tour for the purposes of this review. This post contains some affiliate links, which means that if you clicked through and made a purchase I may receive a small commission. All opinions, images and words are my own, as ever. I remember visiting this a couple years ago! Great post for those who are looking to go. Thank you – I’m glad that you enjoyed it. This sounds really great – one for our bucket list over the next few years! They have clearly put a lot of effort into this attraction. It will be lovely for children to see the books come alive. Absolutely, it’s a great experience. I love the idea of visiting Diagon Alley – I always liked those bits in the books. I know I haven’t got a child at home now but I really should go here with my hubby – I’m sure we would love it and it’s not that far away from us. Absolutely, it’s great for adults too, because it’s just so interesting. I’d go there without children, definitely. I’ve heard a lot about these tours and love the idea of visiting. I think I’d enjoy the interior sets the most too! What a really great review. I think it was interesting from a film perspective even for those who aren’t into Harry Potter, and amazing for fans. I was surprised at how small some areas where it were filmed are. We ended up coming away from the gift shop with the whole blueray box set the boys were so thrilled with the tour. So had your boys seen the films before the tour? It’s great that they enjoyed it so much. It is such a long time since we have been and Mini is currently rereading all the Harry Potter books again. I think we need to add another visit to our summer wish list! It’s definitely somewhere that you can visit more than once, because there’s so much to take in. Thanks Sarah. I was slightly overwhelmed on our first visit, because I’ve loved sharing the books and films with my kids so much. We loved our visit there too – it’s such a magical (in every sense!) place isn’t it? I thought it was particularly so in the run up to Christmas so a great time to visit. You’re right, it was brilliant seeing everything looking festive. 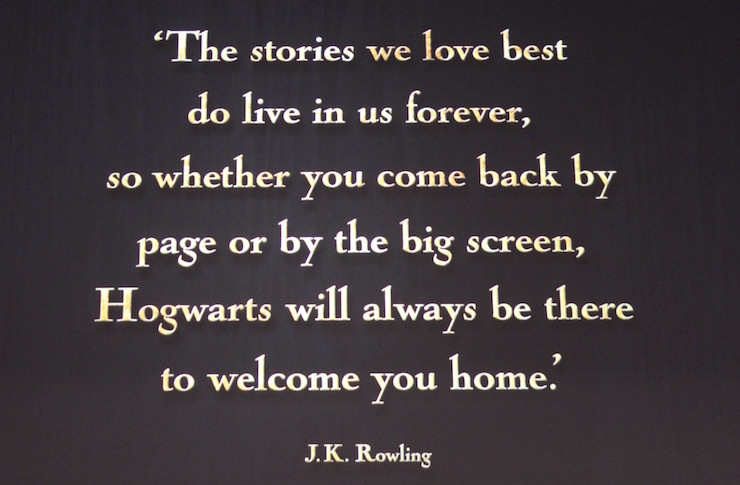 I felt emotional there too, it’s an amazing feeling to go there if you love the films and books.